You can use a DISM command, or even PowerShell. Once you have this installed, you can open up the tool and have a look at the server properties. 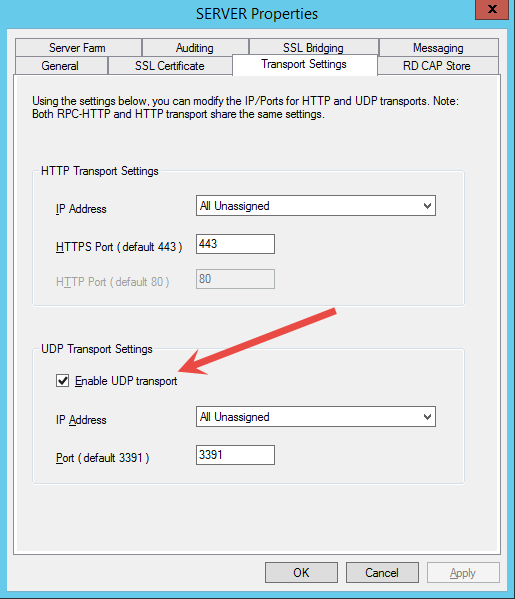 On the Transport Settings tab you see we have two ports configured, HTTPS and UDP. There is a great post here on the awesome work that Microsoft did on optimization of RemoteFX and RDP using UDP. We are not looking at RemoteFX here, but if you had an RDS Session Host Server on your Essentials network, that may become relevant. Clicking here we can see what RDP makes of our connection. So, if you are happy to leave it on the default port of 3391 all you need to is open up that port on your router, in addition to the other usual ports and when you connect into a Windows client that supports UDP you can view the toolbar at the top of the screen which gives an indication of connection quality, and should show you if you are using UDP. If using UDP is still not boosting the performance for you, you may then want to go in and look at changing settings like Color depth or something like that, but hopefully this will give you a good starting point. Whilst this is not ‘news’, it is something often forgotten and overlooked. I know this is an old post, but I’m looking for information applying UDP on the Essentials Gateway that does have an RDSSH server on that network, that all users will connect to. I can publish a gateway within the farm (which is small – 30 users) or use the Essentials Gateway, which is the preference. Your thoughts would be greatly appreciated. You have an Essentials Server at the perimeter, 443 forwarded to that, and then on the LAN you have an RDSH?